April 22nd is the auspicious Hanuman Jayanthi, birthday of Lord Hanuman. Let us recite Hanuman Chalisa, a 40 Verse prayer in praise of Lord Hanuman. Chanting Hanuman Chalisa helps you feel relaxed & completely in control of your life. Hanuman Chalisa can fill a person with divine bliss. 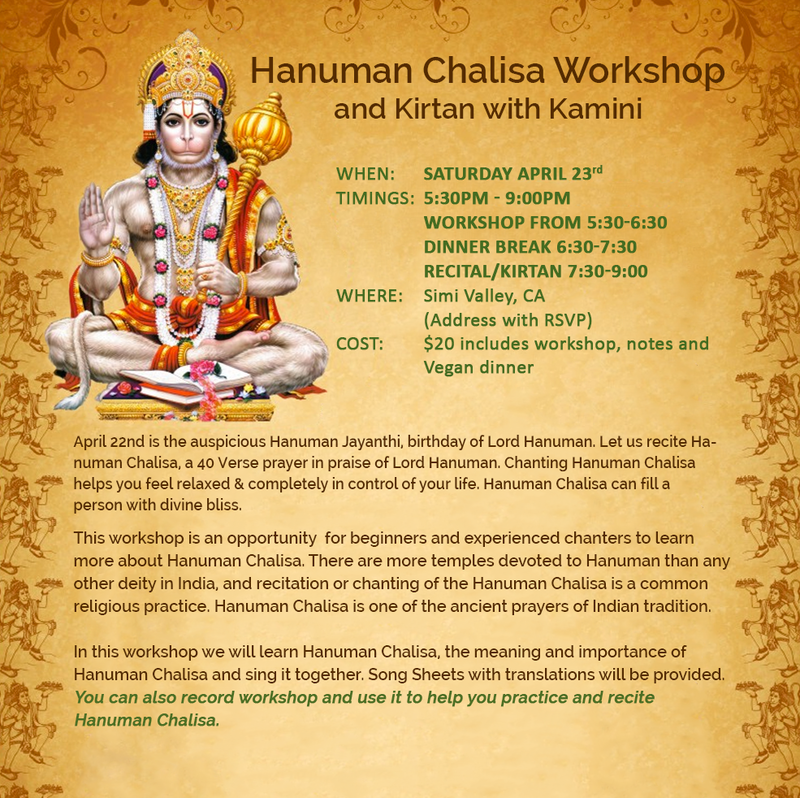 This workshop is an opportunity for beginners and experienced chanters to learn more about Hanuman Chalisa. There are more temples devoted to Hanuman than any other deity in India, and recitation or chanting of the Hanuman Chalisa is a common religious practice. Hanuman Chalisa is one of the ancient prayers of Indian tradition. In this workshop we will learn Hanuman Chalisa, the meaning and importance of Hanuman Chalisa and sing it together. Song Sheets with translations will be provided. You can also record workshop and use it to help you practice and recite Hanuman Chalisa.